Maybe you, too, have an uncle or family member who has shared a similar thought: I vividly remember him telling me that the harder he tried to do good and actually did acts of kindness, the worse things got. This comes to mind in a week when I’ve invited us to reflect on gratitude this week as part of our Lenten journey. When we’ve made it through the wilderness, through times of trial, what is it we’re grateful for? What are we grateful for in this moment? Each week in our Prayers of the People, we offer thanksgivings for our blessings, and since there’s not enough time to name each one, we at least pause in a moment of thankfulness. Intensely focused on what is good, what is going well, we come to late Thursday evening or maybe Friday morning with the tragic news of the mass shootings in New Zealand. In mosques. In places of worship. An outright hate crime. 49 dead. At least 40 more wounded. What does that do to our sense of gratitude? I suppose it depends on who we are and how we choose to react in situations of adversity, when it seems like the Adversary is making an outright attack. I made a quick decision not to click on any links to videos or manifestos so as not to feed more attention to the horrendous crimes that were intentionally set up to grab media attention and go viral. I let our Muslim community here know of our support and solidarity with them. I am genuinely thankful for them. I went to one of their Friday prayer services, where I listened to their prayers spoken and chanted in Arabic. They reminded me of the Ramadan calls to prayer I heard when I was in the holy land. I wore a scarf I bought in Israel, where tensions run high between Christian, Muslim, and Jew, yet they live side by side and have for millennia. I listened to the lecture from the leader who spoke about anger being a natural reaction but one the faithful are not inclined to embody, lest they sound like a braying donkey. I continue to be grateful for faith witnessing to peace. What in my faith, as a Christian, led me to wear a scarf and go sit among our female Muslim neighbors and some of their children? Sincere love of neighbor. Compassion. Compassion sees suffering and shares in it. That suffering might be anger, grief, or deep sadness. With empathy, we can feel what one another feels. 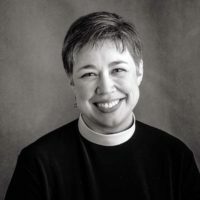 My faith response to trial and grief is to turn to prayer first, so in support and solidarity, I offer not only my own prayers and condolences, but I go and sit with those who are scared, angry, and/or sad. And what of our prayers? Are they always “Lord, have mercy,” “thank you,” and “thy will be done”? They can be. That’s enough. But my experience is that life is more complicated than that. Our tradition shows us that prayers to God get challenging, but they are nothing that God can’t handle. Take what we hear in our lesson from Genesis today. The word of the Lord comes to Abram in a vision. This is before Abram is Abraham, before he’s fathered a child, and that is the focus of this encounter. God has promised Abram that he will be the father of many descendants, but so far the only children in his household are those born to slaves, not his children (this is even before the birth of Isaac). Much time has passed since Abram first had this promise from God, so here in Chapter 15, God speaks to Abram not to be afraid because Abram is afraid that the promise isn’t going to come true. Abram fears that something isn’t right, that the promise won’t be fulfilled. Abram offers his lament to God, and God responds, renewing his promise, making a covenant with him–that’s what all that business with the animals is. The original promise is made and even more is promised, with the land being promised, too. God heard Abram’s lament and responded, not with the actual fulfillment yet but with promise for even more. And Abram believed. And the LORD reckoned it as righteousness. In faith, Abram trusted that God was remaining faithful, that the covenant made would be kept. This psalm speaks to me deeply, to my great faith and to times of trauma in my life when it feels nearly like an out-of-body experience. Yes, my faith is strong, but, O God, this reality can be too much to bear. The worst thing imaginable in that moment is to be forsaken even by God when all that I know and have evidence of seems to have turned against or away from me. The trust of the psalmist is that the LORD will sustain us, won’t abandon us, will be our comfort, and is our salvation. The mosaic on the altar in Jerusalem in the chapel where the Lord wept. I would like to think that we wouldn’t have to have times of trial and despair to experience the tremendous love of God, but in the times when we feel most abandoned, when we hunger and thirst most for fulfillment, that is the feeling that I imagine gets closest to the yearning that God has for us, the desire to share that unconditional love, the desire that Jesus expressed as a longing to gather “children together as a hen gathers her brood under her wings.” Why could Jesus not gather the children of Jerusalem together? Because they “were not willing.” They didn’t have the trust or desire to partake in the work of God that Jesus presented, yet Jesus is entirely about doing the will of God, not bending to the powers that be or even protecting his bodily interest. As the letter to the Philippians emphasizes, our being Christian and following the way of the cross, the way of life through Christ, is not about self-preservation, self-fulfillment, personal glory, or materialism. Our Way of Love through Christ is bigger than any one of us, and, like Paul, we experience sadness when others suffer with despair, without recourse to a broader network of faith, hope, and love. Like the image of the good shepherd seeking out even the one lost sheep, the image of the hen gathering all the chicks under her wing gives us a glimpse at an aspect of God we might not expect or might shy away from. 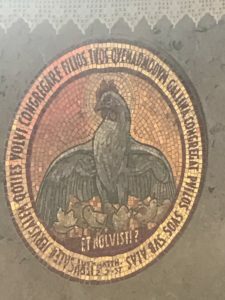 The image of a hen protecting her chicks is not only intimate but also vulnerable, yet is it no less vulnerable than a man hanging on a cross, an image we might also rather shy away from, preferring instead the resurrected Jesus, full of Light and Glory? God knows our trust and our fear, our faith and our doubt, our joy and our lament, and God does not shy away from them but stands all the stronger in the midst of them, especially in our weakness. How can I continue to breathe through my racing heart and shallow breath in times of great fear? How can I continue to live in the face of great tragedy, especially if it is someone I love so deeply? Because we are so loved. Because we have been so loved, so are we called to love others, regardless of what evils we face, what persecution we experience, what fears we have in this body and this life. There is so much we don’t know, that we can’t see, that we can’t describe. Yet we have experienced an ineffable, unexplainable presence of God working in our lives that has changed us into people who live into our faith, not without trials or doubts or suffering, but with resolve to act in ways of love. Our belief in Jesus Christ as our Savior and the understanding of our relationship with Jesus and thus with God enable us to be incredible witnesses to the love of God. How we act day to day may evangelize more than anything else we say because we never know who is paying attention. We do what we do out of love, without expecting anything in return, because we already know that we are loved by God. But when we return the gesture of love, isn’t there great joy? When we are the stranger at the mosque and are welcomed with a smile . . . when someone replies with gratitude for a kindness offered . . . for me that seems to get close to what it feels like willingly to be gathered into mutual love, to be enfolded in the embrace of sheltering arms or wings. We need not hesitate to live into our faith and trust. We don’t need to hold back when we want to rage or lament to God, even against God. God can take it. God won’t drown in our sorrows or tears or be tossed about by the tempest and chaos of our lives and actions. As the psalmist instructs the reader to wait patiently for the LORD, trusting that God fulfills promises faithfully in God’s time, God waits for us with infinite patience and perfect love.